Learn how to make your all-time favorite Dragon Roll at home! In this recipe, we will talk about the key ingredients and tips & tricks to make the perfect sushi roll. Many of you asked me what is my favorite sushi roll, and my answer is always Dragon Roll. I really love the crunchy texture of shrimp tempura inside the dragon roll. Since raw sashimi-grade fish is not required for this recipe, small children and pregnant women can enjoy this sushi roll at home! The dragon roll is an inside-out sushi roll, which means nori wraps around the ingredients inside and the sushi rice is on the outside. 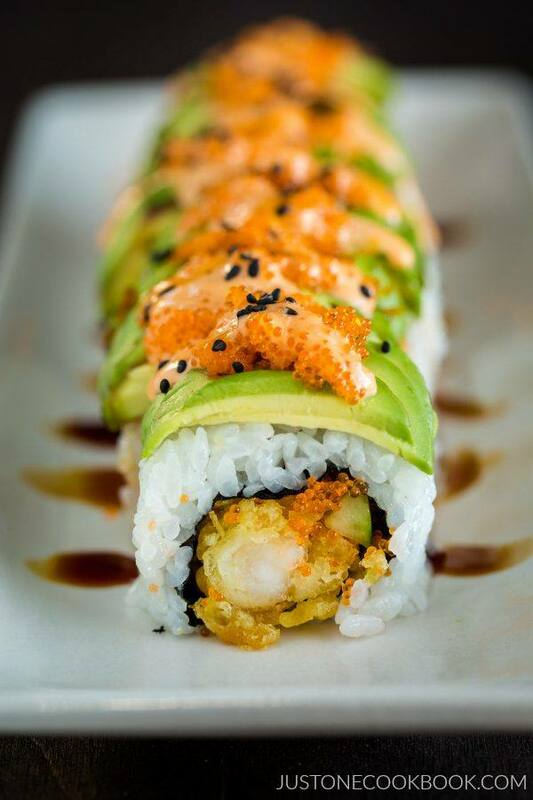 Typically, there is shrimp tempura and cucumber inside the roll, and thinly sliced avocado is placed on top of the roll resembling the scales of a dragon. There are a few versions of this roll, for example some restaurants put grilled eel (unagi) inside the roll instead of shrimp tempura. These days shrimp tempura is pretty popular and many American grocery stores (Trader Joe’s, Costco, etc) carry frozen shrimp tempura. The frozen shrimp tempura tends to be extra crunchy and it’s quite of bit of work to make it like that at home. Instead all you need to do is put the frozen tempura in an oven (or toaster oven) for 20 minutes or so. While the shrimp tempura is in the oven, you can do most of the prep work. Of course, you can make shrimp tempura from scratch, and here’s my Shrimp Tempura recipe. Remember that you’ll need 2 shrimp tempuras for each roll you plan to make. It’s funny to say this, but I feel like the most difficult part of the dragon roll recipe is to find the perfectly ripe avocado. I was very lucky to meet a store staff who selected perfect avocados that will be ready the next day for me, and they truly were! To choose the perfect avocado for immediate use, look for avocados which skin is darker in color. Then gently squeeze the fruit in the palm of your hand. If the avocado yields to firm gentle pressure, it’s ready-to-eat. If the avocado does not yield to gentle pressure, it is considered still “firm” and will be ripe in a couple of days. If the avocado feels mushy or very soft to the touch it may be very ripe to overripe. I use Japanese cucumbers which are long and slender. They have few seeds so it’s perfect for sushi rolls. Persian cucumbers are quite similar so they are a great substitute. If you use typical American cucumber, make sure to remove the seeds as it yields too much water inside the rolls. 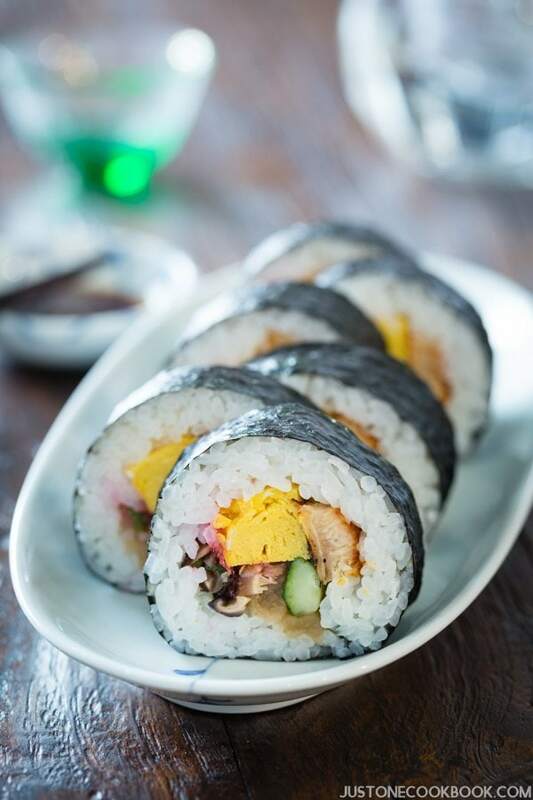 The word “sushi rice” is sometimes used to refer to Japanese short grain rice outside of Japan, but in Japanese cooking, Sushi Rice (酢飯) means steamed rice that’s seasoned with sushi vinegar and only used for all types of sushi recipes. Perfectly prepared sushi rice is very important in sushi making. You’ll need Japanese short grain rice (I use Koshihikari), cook properly (according to my recipe), and make sure to season the rice with sushi vinegar. Another important part that I can’t stress enough is… please do NOT mash the sushi rice when you put it on nori sheet. When you see sushi roll, you should be able to see individual rice kernel, not mushy rice. Also many sushi rolls have WAY too much rice compared to the fillings. Balance of rice and fillings is very important. 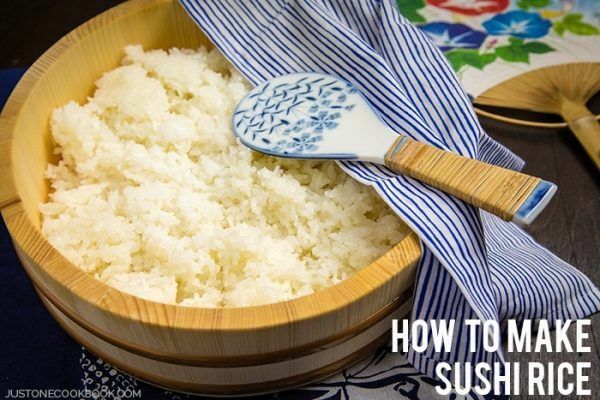 My quick tip is to use a ½-cup measuring cup to fill the sushi rice (don’t mash the rice!) before you put on a nori sheet. That should be enough for half sheet of nori. With the consistent amount of sushi rice for each roll, all of your sushi rolls will be even size! 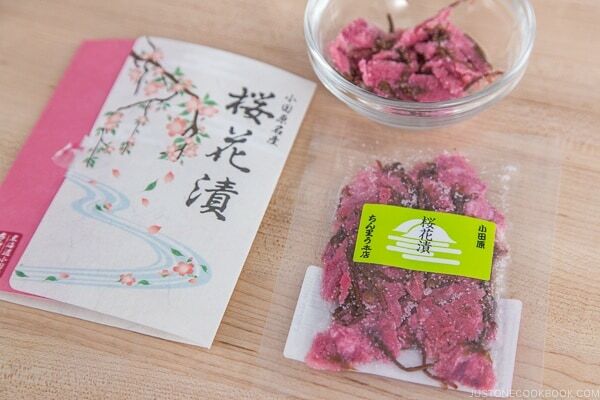 I use half sheet of nori for this recipe. 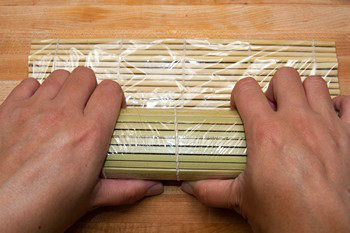 If you make a few rolls and feels that it’s too short for you to roll, you can increase the nori size to 2/3 sheet. But with 2/3 nori sheet, you will required to put more rice, and your sushi roll will be bigger (fatter). Just practice a few rolls and you should be able to make sushi roll with half sheet of nori. 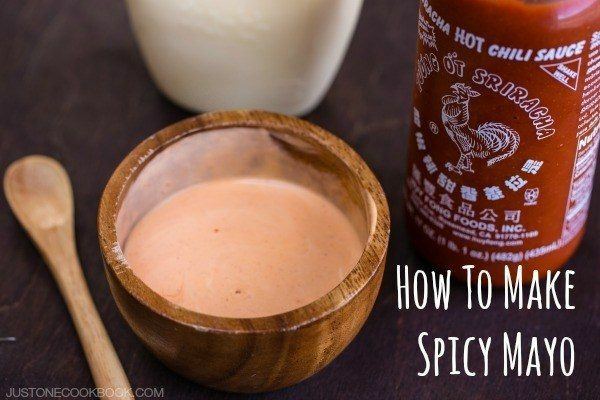 All you need is two ingredients for this amazing sauce! Please use Japanese mayonnaise for this recipe (you can buy from Amazon). I believe it makes a difference for the final flavor. And with the leftover Japanese mayo, you can make Japanese Potato Salad, Sesame Dressing, Mentaiko Pasta, Okonomiyaki, Casesar Salad (Japanese mayo is the key ingredient! ), and more! Although we only need a few tablespoon of unagi sauce, it is nice to serve with this dish. 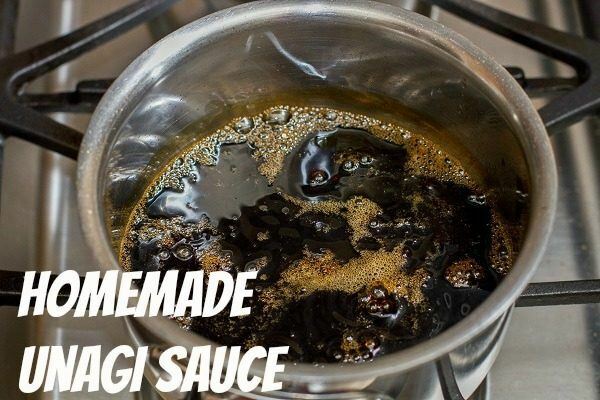 If you can’t find a bottle of unagi (eel) sauce in a local Japanese grocery store, try my Homemade Unagi Sauce recipe. It is delicious and it’s worth making from scratch, especially if you love making Unadon (Unagi Donburi) or Yaki Onigiri. It’s a good condiment to have in your fridge all the time! I hope I’ve inspired you to start making sushi rolls at home. It’s fun to prepare and eat sushi with your friends and family. If you are still not comfortable rolling your own sushi, remember there is a non-roll sushi called Temaki Sushi (Hand Roll)! If you try this Dragron Roll recipe, don’t forget to share your picture on Instagram, Facebook, or Twitter with #JustOneCookbook. Thank you so much for reading, and till next time! Gently press the avocado slices with your fingers and then keep pressing gently and evenly with the side of knife until the length of avocado is about the length of sushi roll (length of nori seaweed). If you don't serve the sushi roll right away, I recommend squeezing lemon over the avocado to prevent from changing color. Editor’s Note: Original post was published in June 2013. The post is updated with new content and video in April 2016. As always, I love the detailed instructions! You make it sound so easy! And this is such a gorgeous looking dish, I really should try it. 😉 Excellent post – thanks so much. I love Dragon rolls though I don’t usually see the tobiko and other granishes on top. Oh my, Nami! Your Dragon Roll looks fabulous. It looks better than some of the rolls that I’ve seen in restaurants. This really makes me want to make my own. Pinned and sharing this on my Facebook page. Have a wonderful evening! 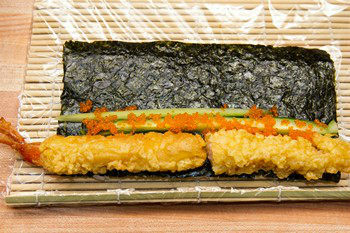 Oh yummy, It’s one of my favorite too, love the crunch of the shrimp tempura in it. Saved to try. Thanks Nami. Oh that looks like a great dragon roll! Any ideas for substituting nori? Will it roll without it? Maybe rice paper? I’m allergic to everything from the water that doesn’t have a fin on it. I thought I’d try making this with a tempura fish, but I’ve never rolled sushi before. Please advise! G’day Nami! That looks like heaps yum and fun, true! Might have to put this on my list to do and always enjoy seeing your step by step photos too! You should open your own little Japanese cafe. You’d do so well in Malaysia for real. Love how delicious and aesthetically pleasing this roll is! I really should invest in a sushi mat, right? I’ve tried making sushi several times without the mat. They hold together OK but I feel they could be tighter and more compact. Nami I love the Dragon Roll. My family always orders them and although I teach sushi I’ve never taught this one before. Now I just might. 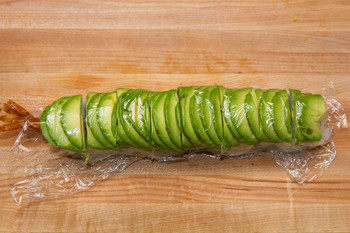 I love how you demonstrate the way to wrap the avocado. I haven’t done that before but will definitely try this now – great technique. Great post. Thank you for sharing. Your dragon roll looks absolutely perfect, Nami! I’m a big fan of it as well! Wow, I am mouth watering looking at your dragon roll picture, the steps sound easy to make, must find one day to make this roll. Have a wonderful vacation back home, Nami! Beautiful! Although it’s funny, every place I’ve been to here in Southern California would call this a caterpillar roll, and a dragon roll would be a uramaki roll (usually california roll) topped with unagi. Nami, this is one of my favorites, though I figured it was unauthentic — but I feel better knowing you eat it too! lol The tempura-only one is my favorite too. Your presentation is always so beautiful. Have fun in Japan! Oh wow! That is a lovely treat indeed! 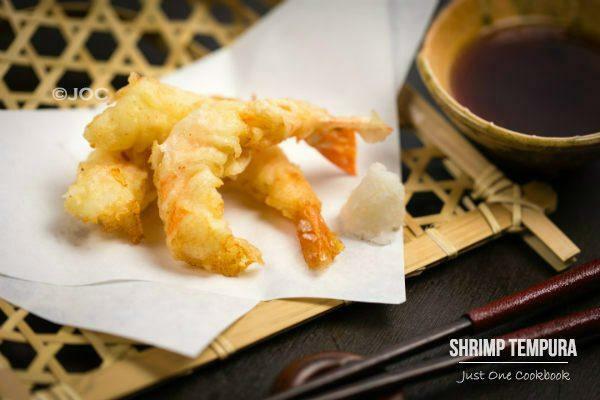 I just love shrimps tempura! I can just imagine the taste, crispy tempura shrimps blending with smooth avocado and crunchy cucumber! yum! This looks so beautiful and I don’t eat shrimp (prawn). I’ll find a substitute as I am looking forward to attempting to compile this. Thanks for sharing. Just beautiful! And your step by step pictures are so helpful. I love your site and recipes Nami! I am now craving sushi at 1 in the morning! hello Nami, I caan see why that is your favourite! delicious!! Nami, it’s one of the most beautiful maki sushi I have ever seen! It does look a bit like a dragon indeed 😉 It contains all my beloved ingredients, so I’m bookmarking it, though there is little chance I will manage it… It looks quite delicate for someone as clumsy as me. Actually I have never seen such a roll in Europe. The only roll they prepare here is also “reversed” (seaweed inside) but with ebi fry inside, mayonnaise and sprinkled with sesame seeds. I love it. Have a wonderful trip and bring us back many delicious ideas and photos! Oh wow, I love these avocado dragon rolls.. This looks SOOO good, Nami!! Dragon rolls are my favourite too :). I am glad that you didn’t use unagi, because I am just not into eels – they remind me too much of snakes ;). Anyway, great post as usual, so sorry if I haven’t been commenting regularly lately, life just has been quite crazy over here…! This is so professional looking!! This sounds great, really useful step by step pictures too. 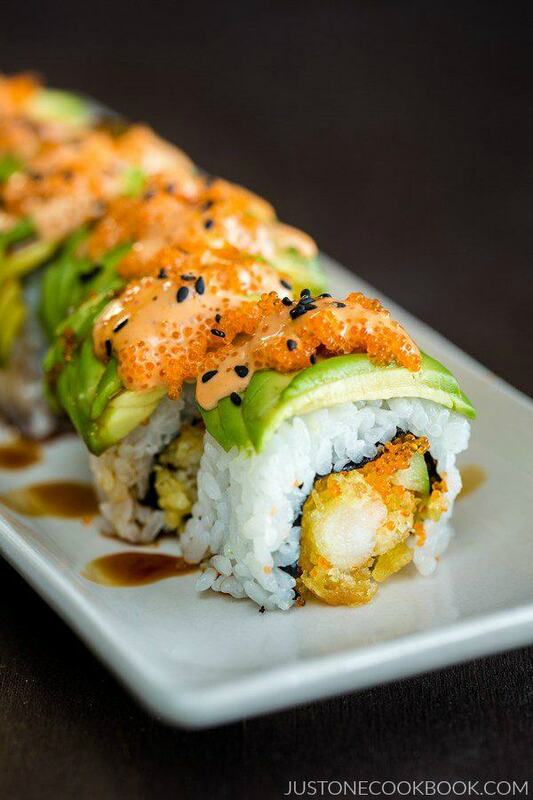 We love love love sushi and this dragon roll is one of our favorites. I don’t make it, though because I think the Chefs at restaurants do a better job. YOu just made me more brave to try. Thanks for sharing, Nami! Hi Nami, thank you very much for sharing this lovely dragon roll. Looks very pretty and delicious! Definitely love to try this at home. OMG Nami, I cant thank you enough, this post is precious with the dragon rolls and all the links to other sushi recipes, Super pinned! I hope you are well and that you;re having fun. Wow, these rolls look perfect Nami! 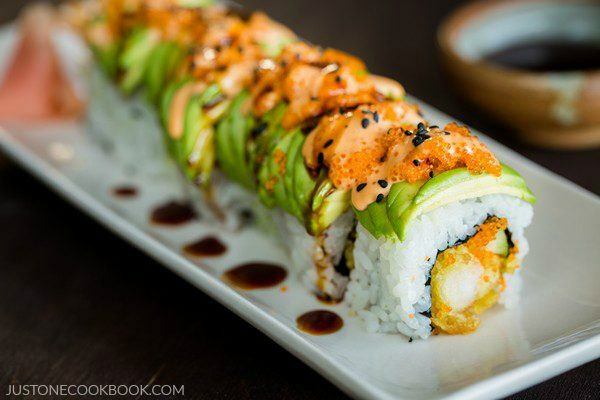 Love dragon rolls and yours look flawless. Just amazing! Can you give me a recipe to make a spicy vegas roll? That is my very favorite! I have spotted suchi rice (not easy to find in Mumbai, except gourmet and online stores) in a supermarket in Mumbai, and from there itself, I bought some nori sheets too! I have most of the ingredients with me as well. So I can make this. And, this tempura-stuffed sushi is really looking special…wonderful clicks, Nami. A lovely post! Beautiful colors and presentation! Gorgeous rolls. I think I had this before – not sure if it went by this name, but it’s so delicious. I have to admit though… I’m really not a fan of tobiko. The consistency always seems so weird to me, but all the rest of the ingredients I love! Spicy mayo too… mmm! This looks amazingly good! I think this is my favorite sushi roll too… I tasted it at a JApanese restaurant when living in Singapore… I remember the crunchy shrimp tempura in the middle is divine! 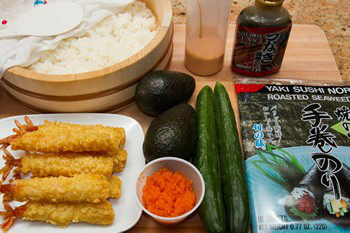 As soon as I can eat sushi again I will try making this at home. Thanks for this recipe and have a nice vacation in Japan. We are also flyign to Italy soon for our summer vacation… I am looking forward to it. Gorgeous roll! You’ve got me itching to make my own sushi. What a stunning dragon roll, Nami! This is something I never realized could be made at home and you really knocked my socks off with this one! So lovely. Thanks for sharing! Gorgeous and mouthwatering!!! I am sure that you’re having a great time in Japan. This is an amazing presentation. Hope you have a great time in Japan. Looking forward to your updates. Wow! You are just so clever! This is the best looking Dragon Roll I have ever seen, I love the caviar. Nami, I tried a Dragon Roll for the first time when I visited my daughter last week. Scrumptious and so timely that you posted your recipe. I can see why it’s your favorite! Love this! Wow…this looks fantastic!!! I am so going to Trader Joe’s to check out the shrimp tempura!! I love this sushi and you did such a beautiful job! Ooooh I loooove this sushi, Nami! And look at that beauty…wow! Your photos are stunning. Beautiful! This puts restaurant rolls to shame. That looks like a perfect combination of flavors and textures. Nami, the rolls are more than perfect, congrats! 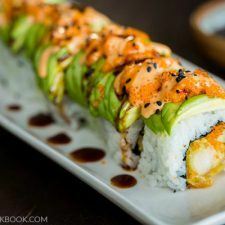 This dragon roll look amazing and I love how to show the pictures to make!! I am going for sushi tomorrow for dinner, I will see if they have this roll because it looks delicious. I wish I could make such a beautiful sushi Nami but I can’t, so I will just admire yours which is delicious! Have a wonderful time in your homeland and come back with many new and more delicious Japanese meals! That looks awesome! I donno if I would really call it a dragon roll coz it is looking so pretty! One of the best sushi rolls I have seen till date! Definitely better than the restaurants. Yummy! Nami, I wish I lived closer to your place. Your Dragon roll is gorgeous Nami, a favorite of mine too. Now I am craving sushi lol. Enjoy your time in Japan dear.. looking forward to catching up with ur fun on instagram! So glad I’m not the only one who was a bit shocked to see sushi with cream cheese. And like you, over the years I’ve come to accept and like non-traditional temakis…including the Dragon Roll. Thank you for sharing your recipe, Nami-san! Dragon roll always seemd to be so difficult to make. I need to try it. Thank you Nami. This is so beautiful and impressive! Love all of the pictures to show the process. Definitely needed for a sushi recipe of this magnitude! Your photos of the finished product are beautiful! My absolute favourite sushi rolls are salmon rolls, but Dragon rolls are a close runner up. I might try to make this one day when I’m feeling ambitious. Stephanie, thanks so much for trying dragon roll and California roll recipes! 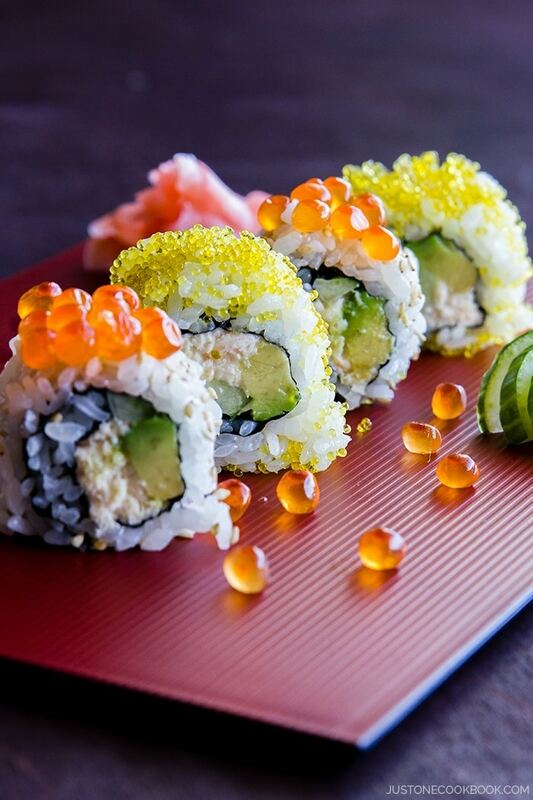 Your sushi rolls are beautifully made! Yummyyy! I love all kinds of sushi and sashimi, but when we go out we never fail to order dragon roll. I love your pics and how neat they are. Have fun in Japan! I am COMPLETELY inspired. This is my summer project – learn how to make sushi from you. Seriously, this is great stuff. Thank you Nami for taking out your precious time to show how it is really done. I love the step by step pictures – it makes it look relatively easy. Bookmarking. Nami… This looks amazing!! I love dragon rolls. Excellent job and BEAUTIFUL photography! I, too, love Dragon Roll. You’re so lucky to have Trader Joe’s there – and they sell frozen shrimp tempura? Awesome…! Your roll looks absolutely gorgeous. You make it look so easy, Nami! I’ve never had this luxurious looking sushi rolls before 🙂 but I know I’ll love it! It has my fave ingredients – shrimp tempura! Looks absolutely scrumptious! So thrilled to see dragon roll recipe on your site, Nami! It is my favorite sushi too since it features both avocado & shrimp tempura (LOVE them!). 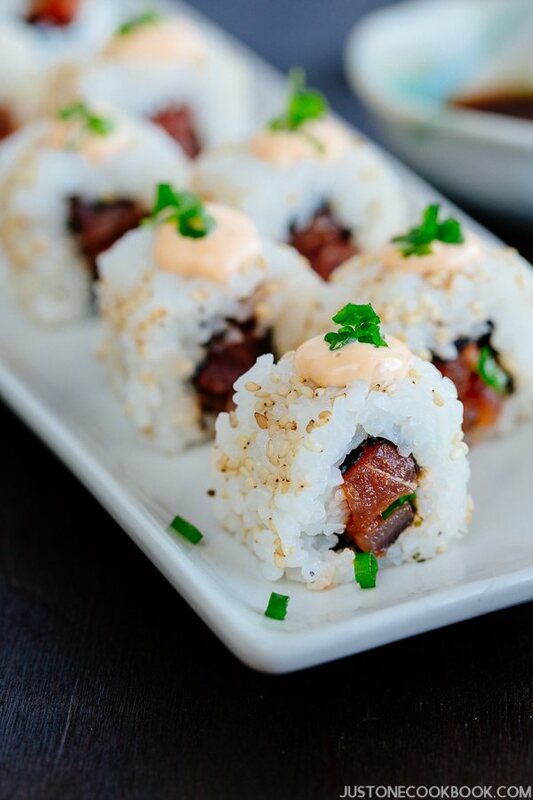 The spicy mayo & unagi sauce toppings make your dragon rolls extra good looking. I can eat this everyday! I love dragon rolls! I absolutely love shrimp tempura so a sushi roll with shrimp tempura in it will obviously be my favorite as well. I`m glad I have this recipe in my arsenal! 🙂 I think it`ll take me many tries before I can make them as pretty as yours! Your pictures as always AMAZING. Thank you for sharing! The Dragon Roll is my favorite too! ^_^ Have fun in Japan! I’ve had these in California and they’re positively scrumptious! Thanks so much for sharing the recipe so I can reproduce it at home! excellent photos and above average explanations!!!!!!! Hi Tracy! Thank you so much for your kind compliment. 🙂 I’m so glad you found my site! What kind of sauces have you tasted before and what kind of rolls? Sorry I usually eat more traditional nigiri sushi and don’t eat too many rolls, so I’m not too familiar with the kind of sauces for rolls (we don’t have this in Japan). Hope I can help you. This recipe is exactly what I have been looking for. I am glad I found it on your blog. Your dragon rolls look so beautiful. Thanks, Nami! The roll is tempting and nice. Would you know where to find real unagi filets? Or would using frozen ones come out the same? Do you have suggestions on how to prepare it so that it comes out yummy? Hi PandaMamma! I’m not sure where you’re located, but in SF, there are Japanese unagi (grilled already) shipped from Japan. They are like close to 3 times more expensive (and small.. but so delicious!). I live in Tokyo and was surprised to see that “Dragon Roll” “Philly Roll” “Rainbow Roll” did not exist in Japan! It was after some thought that I realized that these creations were uniquely American, that is, fusion sushi. 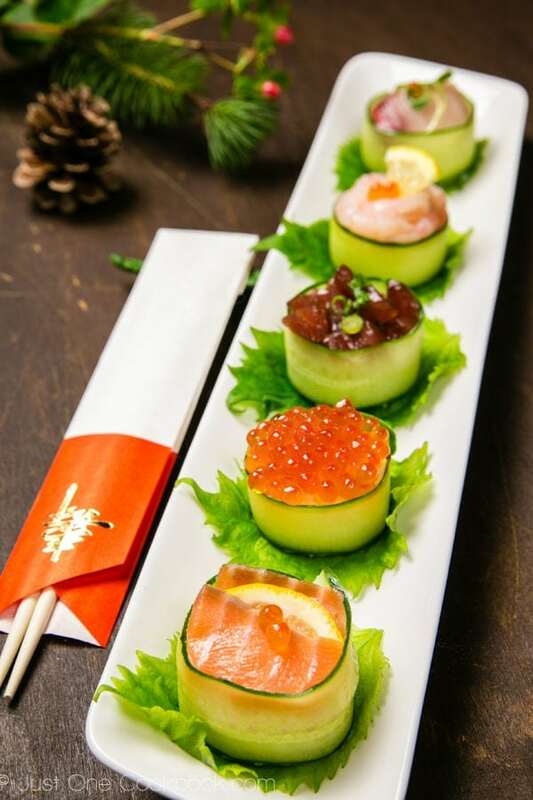 Now there are fusion sushi found everywhere, but not in Japan (except for California Roll)! Thanks for sharing this recipe. I can get all the ingredients fresh here in Tokyo. I looooooved this Dragon Roll, it was perfect!! Hi Joanne! For me it was an opposite experience – I was so surprised that Americans think of sushi as more of sushi rolls rather than nigiri. 😀 I love dragon roll mainly because of crispy shrimp tempura in it. I hope one day Japan will get these “American” sushi rolls. But I think a lot of people like to eat at more traditional sushi place and if they serve “American” style, maybe customers feel they are not authentic enough? Maybe good quality sashimi being eaten with other ingredients (with lots of sauces) is sort of against the concept of simplicity, quality of ingredients, and all the virtue of Japanese cuisine (washoku). Well, California roll made it! 🙂 Thank you for your feedback! Looks amazing! I want some. I have to try my hand in making sushi. Hello, I LOVE your recipes and I would be most grateful if you have any videos on making sushi rolls!? I love your blog. The pictures and recipes are easy to follow. Best of all, the results are yummy! Please keep on blogging. I love this roll and tried making it for the first time last night. It turned out great but my spicy mayo was a little thin, I used the Kewpie and Sriracha sauce. For flavor, it worked great, but made the presentation look like I put pink gravy on it. Do you have a suggestion for thickening the sauce? That answers my question, Thank you. I did put a little more sriracha sauce and knew that was my main problem, but the color looked right and the spiciness was good for me. I imagine slowly adding cornstarch might do it, I would be afraid of clumps. I will try it and see how it works. Hey could you tell me how many calories are in this whole dish please? :) it looks awesome!!!! Hi Bri! Thank you so much for your kind words! As I am not a registered dietitian, I am not comfortable sharing nutritional information for any of my recipes. Please use online calorie counters to obtain the information. So sorry! You have done a fantastic job not only on the presentation but also the easy explanations of each recipe..thank you…all is very precious..
update: made these last nite – they were **wonderful! ** Thank you! i think they came out a little big though b/c we used a whole sheet of nori??? I rarely leave comments, but your simple, solid approach to show and tell in a cuisine that is very leftfield for many was perfect. We had an amazing first effort and are now inspired (though the wife will do the rolling!). Just FYI for those out there, the unagi sauce recipe ROCKS and you can use smoked eel if that’s all you can find (just take the skin off and cook gently in the sauce). Sincere condolences to you and your family, Nami. I imagine your grandmother would have been so proud of all you are as a human being and all you have achieved. Not to mention her gorgeous great grand children (and handsome and accomplished grandson-in-law, Mr JOC ) ☺️ I’m glad you had some good times in nature, unplugged. What beautiful Dragon Rolls! I will make some when my sister visits this month. We’ll also enjoy Futomaki. It’s the sushi I fell in love with at age 7 when our “baby sitter’s” mom made it for us in Honolulu! Thanks so very much. I’m sorry to hear of your Grandmother’s passing and understand how much you miss her. I’m sure she was sooooo proud of you — just for being you, and also for lovingly passing on your wonderful heritage foods and stories. Hi Judy! Thank you! 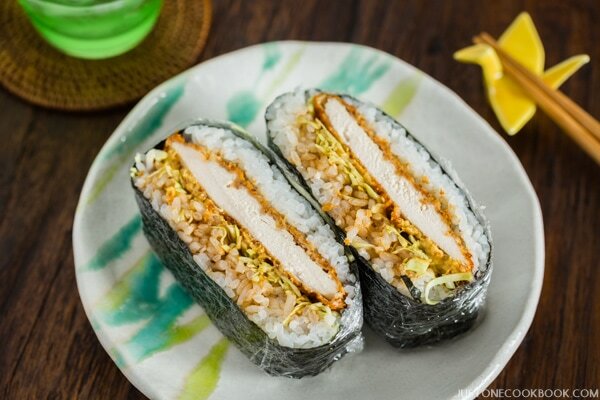 Futomaki is delicious – all the traditional ingredients always make me nostalgic. And I did make it with my grandma so good memories. 🙂 It’s wonderful to know you also have a good memory with Futomaki! Nami-san, I have a question about selecting the best nori for sushi. My husband and I have made sushi at home and sometimes the nori is too chewy, not crisp like we get in the restaurants. Is there a brand or some specific type that we should try to buy? We do have a good Japanese grocery store nearby. And thank you for this recipe and the shrimp tempura trick! Dragon roll is our favorite too! Now I really want sushi. This looks amazing. Dragon Rolls are one of my favorites – minus the spicy mayo. I like the video, you make it very easy to follow. Dragon rolls are great! Never even thought of making them at home, though. This is a pretty straightforward recipe, though. Great tip on frozen shrimp tempura — didn’t know that. Thanks! Hi Anna! Hmm, to create the same “crispy” filling, I still recommend putting the tempura dish. It can be white fish tempura (you have to make it though) or asparagus tempura.. what do you like? Shrimp tempura is convenient as we could buy, but I guess you will have to make tempura from scratch. Eel is also pre grilled, so you can save time if you use it. Thanks for replying Nami!! I will try to make it with white fish instead! I am sorry to hear about your grandma too. Nami, I think you need to start a restaurant in your home or something! These dragon rolls look amazing, as good and better than any I’ve had! I love dragon rolls and I need to get some soon! Absolutely gorgeous Nami!!! I’m not a big roll fan, but I do like a good dragon roll. Hi Reema! If you really want to make a good sushi rice, please consider buying rice vinegar. Sometimes you can substitute with something else, but this recipe, having a few ingredients, is not a good recipe you can swap ingredients. The flavor of sushi rice relies on rice vinegar, which is not strong like regular vinegar. Rice vinegar is mild so it’s perfect for this recipe. If you use regular vinegar, you may not want to eat the sushi rice. And if you skip the rice vinegar… it’s not sushi rice anymore. A lot of people are confused with this “sushi rice” with regular steamed rice. You’re making sushi rice to make sushi right? We only use this for sushi recipes. I just found your recipe and I for one can’t wait to try and make it. Looks wonderful! You have such a great blog! I love that you offer so many sushi recipes with step by step instructions. Great job!!!! 20 OZ???? Can that be correct?? Hi Yolanda! Oh no! It is supposed to be 1/8 cup (2 Tbsp) = 20 grams (not oz!). I have edited the recipe. Thank you for letting me know. This is a really nice recipe, but it seems that it is a little hard to make. I never made something like this before, I think I should have a try this weekend. I would come back when I have any questions. Bless you! Most people think jamming their thumb into an avocado is the way to test for ripeness, leaving everything they touched covered in bruises. Your way, the way I learned, too, leaves the rejects unmarked and beautiful for when they finally soften satisfactorily. Thanks! I used to teach cooking classes, and when I’d take my students to shop for ingredients, I told them I’d hit their knuckles with my ruler if I caught them doing that. /:) I’ve seen people keep pressing with their thumbs until they’ve made a dent, then shake their heads and put it back. Oh! And I never said, great video! Very helpful seeing it done, and it looks delicious. Haha with your ruler! LOL! I don’t like finding out bruised fruits at home, so it bothers me that someone (like my children) creating bruises to someone else’s fruits. You were an excellent teacher. 🙂 Thank you for your kind words. I am new to your website and very happy to find someone with the ethnic background to help me prepare and pursue Japanese cooking. I am 1/2 Japanese however, my mom has passed and I was not able to learn from her. Thank you for your knowledge and desire. Can you tell me if I could substitute something for the fried shrimp, I am severely allergic to all shellfish. I can eat fish. I have a local restaurant that has a lot of different sushi that I can eat. Yummy. Thumbs up on the recipe/directions! We didn’t have any shrimp on hand so we went with unagi (our freezer is full of unagi). They were excelent; Keep up the great tutorials!